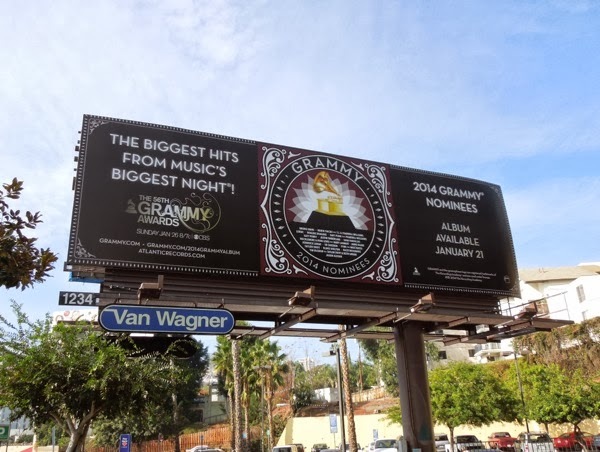 Awards season is upon us, and after the glitz and glamour of the television and movie ceremonies like the Golden Globes and Screen Actor Guild Awards, it's time for the strutting and swagger of the music industry's main event, The Grammys. 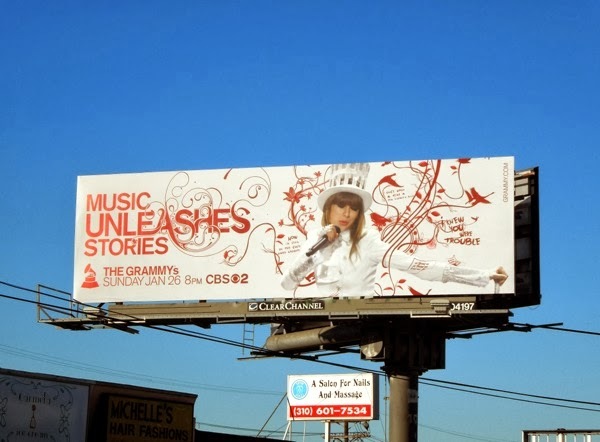 The 56th annual Grammy Awards will be held at L.A.'s Staples Center today and here's an array of billboards from this year's 'Music Unleashes' ad campaign that have been publicizing the event to be aired on CBS. 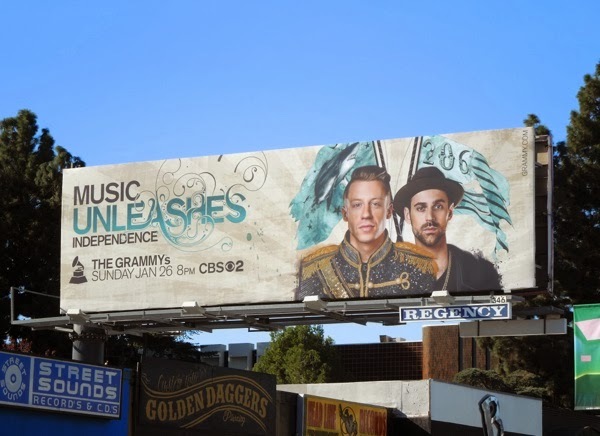 Pink, Macklemore & Ryan Lewis and Taylor Swift are the showcased artists for this billboard campaign, whether it be Pink unleashing 'rebellion', Macklemore & Ryan Lewis unleashing 'independence' or Taylor Swift unleashing 'stories' through their music (thankfully there's not a Bieber in sight). 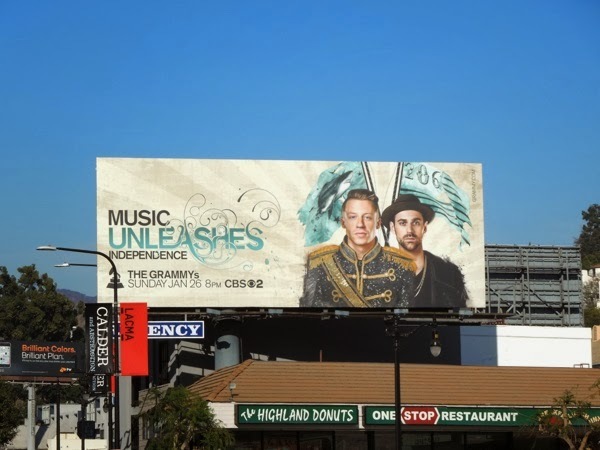 There's also this 2014 Grammy Nominee album billboard to be spied along the Sunset Strip in the run up to the broadcast, this one snapped on January 10, 2014. 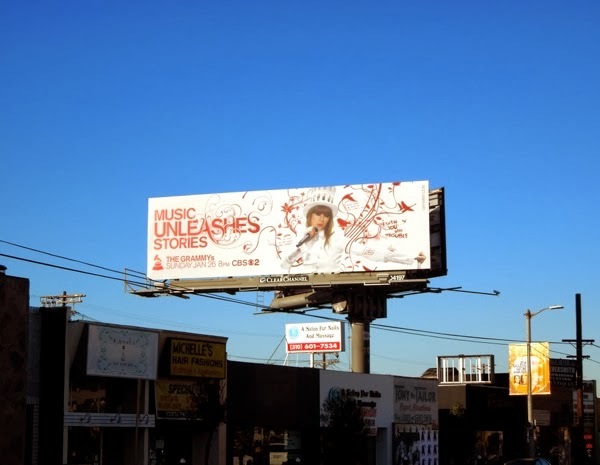 These billboards were certainly all over this city at the start of the New Year, from Santa Monica Boulevard to Highland Avenue, Melrose Avenue to West L.A., 3rd Street to Fairfax Avenue, Sunset Boulevard to La Brea Avenue, and were photographed from January 2 to January 14, 2014. 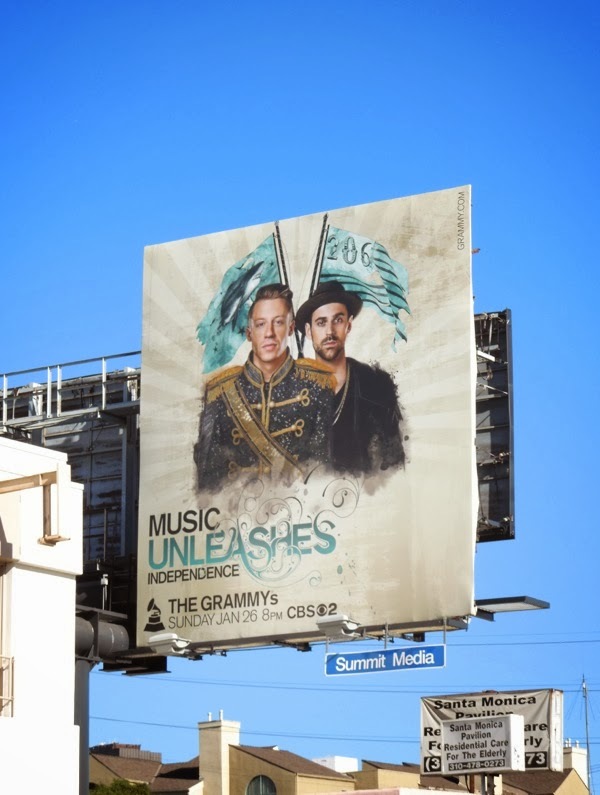 These featured recording artists, all nominated for various awards from Best New Artist, to Album of the Year, or even Song of the Year, represent a broad spectrum of music styles and audience tastes to help draw a diverse viewing public. 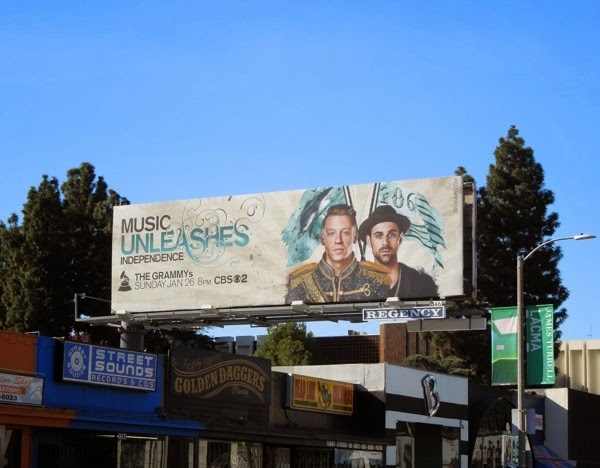 What do you think of this year's ad creatives compared to previous billboards for the awards show, especially as this year there's not a hashtag in sight? 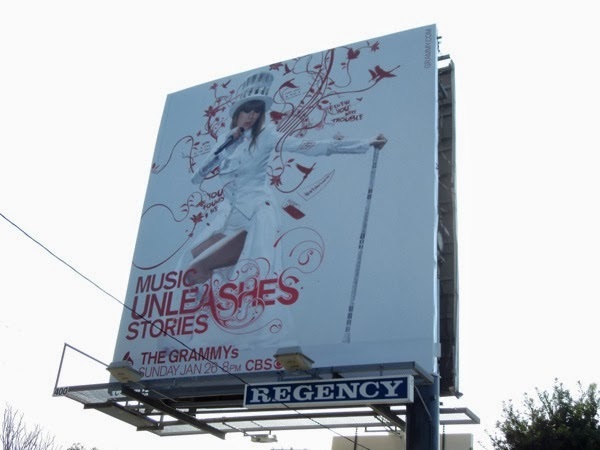 Be sure to check out these billboard designs for The Grammys from previous years to compare and contrast. 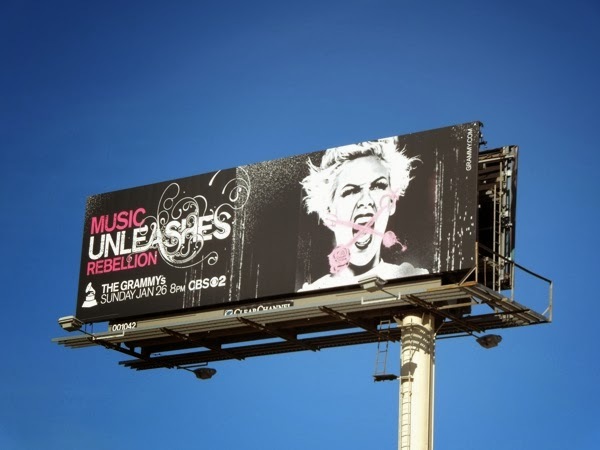 For another approach to advertising a music awards broadcast, take a look at this special glittering lips billboard for the American Music Awards from last November 2013. Now that The Grammys have been awarded for another year, let the countdown to the Oscars begin.